Construction of Richard B. Russell Dam on the Savannah River was completed in 1983 and the lake reached full pool in December 1984. The 210 foot high dam creates a 26,650-acre lake which stretches 30 miles up the Savannah River to Lake Hartwell Dam. Russell is a multipurpose project constructed under the supervision of the Savannah District, U.S. Army Corps of Engineers. The construction of Lake Russell in 1984, between Lakes Hartwell (built in 1962) and Thurmond (built in 1954) created a 120-mile long reach of near contiguous reservoir habitat along the Savannah River. Together, these three reservoirs form a scenic chain of lakes 120 miles long, spanning 153,750 acres of flat-water fish habitat along the Georgia/South Carolina state border. Lake Russell is managed by the U.S. Army Corps to provide: power production, flood control, recreation, stream flow regulation, water supply, and fish and wildlife management. Lake Russell is managed as a “conservation lake” and as such the undeveloped shoreline provides a unique fishing experience in an unspoiled setting. Federal regulation prohibits private shoreline development, and the lake is protected by a 300 ft. collar of protected land. The Lake Russell fishing experience is similar to that of the pristine Lake Jocassee experience, except in a piedmont setting. The Russell experience goes beyond just fishing – visitors enjoy the beautiful scenery, as well as the abundant wildlife. Lake Russell is distinctive in that it maintains habitat for a diverse assemblage of warm-water, cool-water, and even cold-water sport-fish. The dominant and most popular fish species targeted and caught by anglers on Lake Russell include warm-water species - black bass (spotted and largemouth), crappie, and catfish. Due to the fact Lake Russell is managed as a “conservation reservoir” the lake provides exceptional habitat in the form of standing, downed timber and other woody debris. This extraordinary habitat is popular with both the fish and fishermen. The headwaters of Lake Russell along the Savannah transition into a short river tailrace segment of the about 1-mile extending up to the Lake Hartwell Dam. Due to the cold-water releases upstream from Lake Hartwell, Lake Russell provide habitat for a cold- and cool-water fishery. The backwaters of Lake Russell and the Hartwell tailrace area provide cold- and cool-water habitat for trout. Both states stock this area with more than 30,000 trout annually. The tailrace fishery is accessible via developed recreational bank access areas, including handicap accessible piers on both sides of the river channel. The trout fishery is largely for recently stocked fish, but occasionally anglers catch larger hold-over trout that have grown out in the river and/or lake. The tailrace area and the depths of Lake Russell also provide excellent cool-water habitat for striped bass. The current S.C. state record striped bass, 63 pounds, was caught in 2009 from Lake Russell. In recognition of the trophy striped bass potential of Lake Russell both SCDNR and GADNR recently enacted regulations to protect, sustain, and enhance the trophy striper fishery. Lake Russell has 23 recreational access sites. The U.S. Army Corps maintains recreation areas at the Russell Dam Overlook and a bank fishing area below the Russell Dam in the tailrace area. The Corps also maintains an informative visitor centers at the Russell Project Management Office. 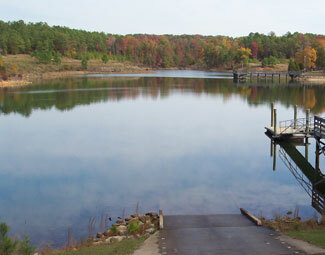 There are 21 recreation/public access areas on Lake Russell (8 in Georgia and 13 in South Carolina).